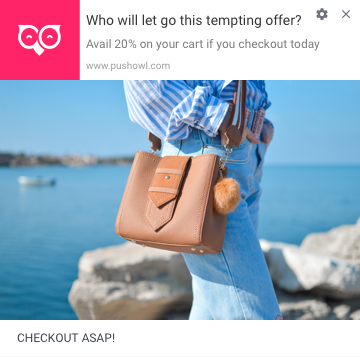 Use web push notifications as an additional revenue channel to increase your sales and recover abandoned carts. If you’re looking to start a business with minimal costs, dropshipping is one of the smartest ways to sell. Starting a dropshipping business takes less than a day. 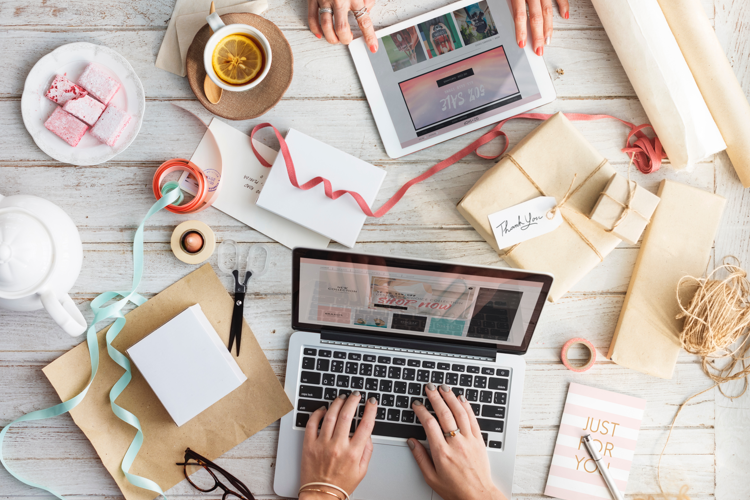 Once you’ve set up your store, picked out the best products, tweaked your store’s pages, and put up the best deals for each of your products, your store is good to go! One aspect of the business that dropshippers have to worry about is marketing and getting the word out about the store. Most store owners spend a lot of time and money on driving more attention to their store. They run ads and boost their posts on social media to bring traffic to their store. Store owners expect a portion of this inorganic traffic to convert into a successful purchase. Ideally, a store owner would want to reap the benefits of the site visits even after the ad campaigns are completed. But this isn’t easy with the increasing competition. The same traffic that these store owners bring to their own store is being pulled by other dropshipping stores. You’ve spent thousands on driving traffic to your site, so how you can stand out and make them come back to your store over the others? How can you best leverage and retain this traffic? One proven way is by using web push notifications to turn your website traffic into store subscribers. Let’s look into how you can use this marketing tool for your dropshipping store. Simply put, web push notifications are short messages that show up on your screen. These notifications take seconds to read and, with features like Smart Delivery, push notifications are sent to subscribers during their active hours, grabbing their attention at optimal hours without disturbing them. 1. Web push notifications are an easy opt-in. Store owners have the opportunity to grab subscriptions from website visitors as soon as they land on the storefront. Unlike emails that require a double opt-in, push notifications take seconds to catch new subscribers. 2. They are hard to miss. Push notifications appear straight to the subscribers’ screen, requiring no inboxes. This gives their store high visibility and merchants don’t have to worry about their promotions ending up in any spam folders. 3. Web push notifications are multi-platform. With web push notifications, there are no platform restrictions. Your visitor could be on a smartphone or a laptop; they still have the choice to opt-in and receive push notifications on their particular device. Note: iOS devices don’t support web push notifications. They are still developing this feature and plan to roll it out soon. 4. Short and sweet, they are highly actionable. Push notifications have a character limit, ensuring store owners keep their messages short and to the point. This means that each promotion is specific and takes little time to read. Moreover, store owners can add buttons to include CTAs that make subscribers act on the push notification quickly. 5. Stores can get started with push marketing immediately. Unlike other marketing channels that take time and effort to build an audience, getting started with push notifications is simple. Once you've set up the push notifications app, you're good to go! Your visitors can instantly opt-in and subscribe to your store. All you’ll need to do is enable automations and start sending promotions. Just like every marketing channel, the kind of push notifications you send and the strategies you use to maximize your push marketing varies according to the niche. Dropshipping stores have specializations from toys to books to clothes. Even with this, there are a few key push notification tips that are common and work like a charm for all dropshipping stores. The tone that you use in your promotions plays a role in the way your customers see your store. It’s crucial to maintain a consistent tone of voice that suits your store and how you want to be perceived. Build hype by teasing your customers about something big that's about to happen in your store. By setting up a vague promise, you can make them want to click through and see what's next. Use this energetic and fun voice to make your customers eager to know more. This tone is easy to execute and is commonly used by many stores to make their promotions as cheerful as possible. You can explore other tones of voice for your push notifications and find one that fits your store’s voice. As a dropshipper, you would have several kinds of unique products that you would want to promote. But it's crucial not to spam your customers with too many promotions. By narrowing down the type of promotions that will work for your store, you can leverage your subscribers' attention more wisely and steer them towards purchasing from you more quickly. As a dropshipper, your store would be stocked with unique and one-of-a-kind items. They could also be special edition products with a limited stock. To maximize this inventory, you can put these products in the spotlight by featuring them in your push notifications. By doing this, you can bring more attention to the item and increase sales. Dropshipping stores frequently run flash sales and need to send their promotions and get visibility as quickly as possible. 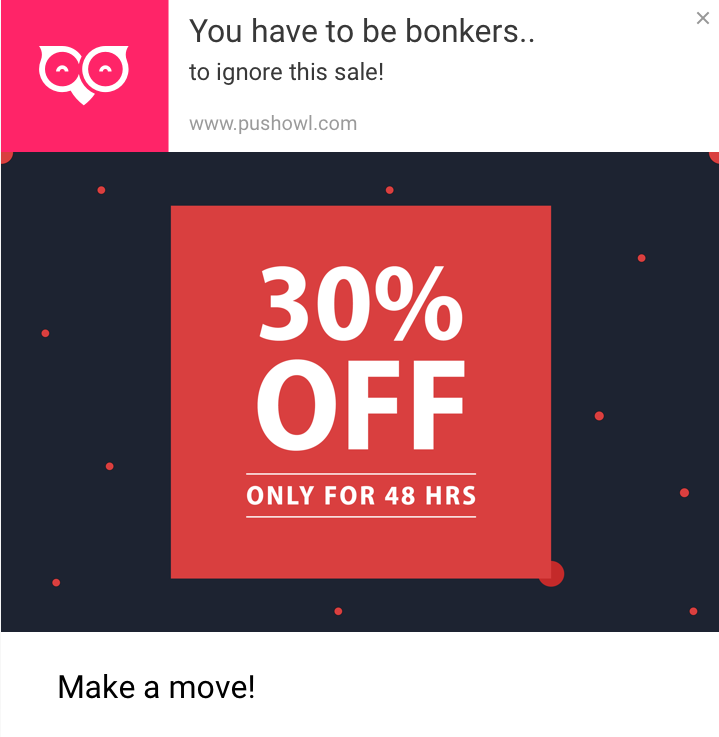 Send push notifications to your subscribers, informing them about your deals. You can write copy for the notification that elicits urgency and persuades your subscribers to rush to the sale faster. 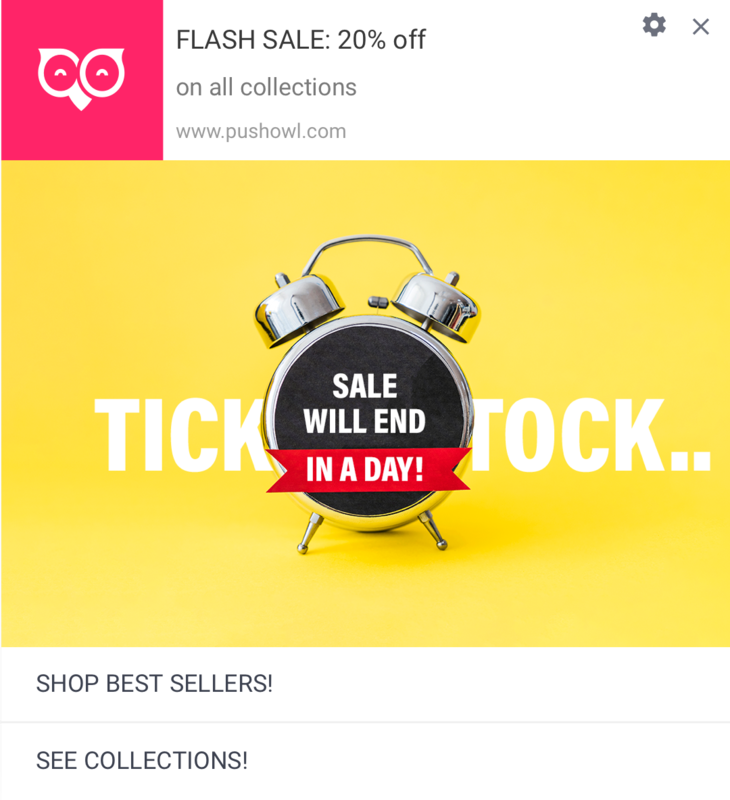 Pro-tip: Use the ‘Flash Sale’ feature when sending a campaign to ensure that your push notification doesn’t deliver to your subscribers after the sale is over. You can read more about the Flash Sale feature. Bringing back an old customer has more returns than spending ad money to acquire a new one. 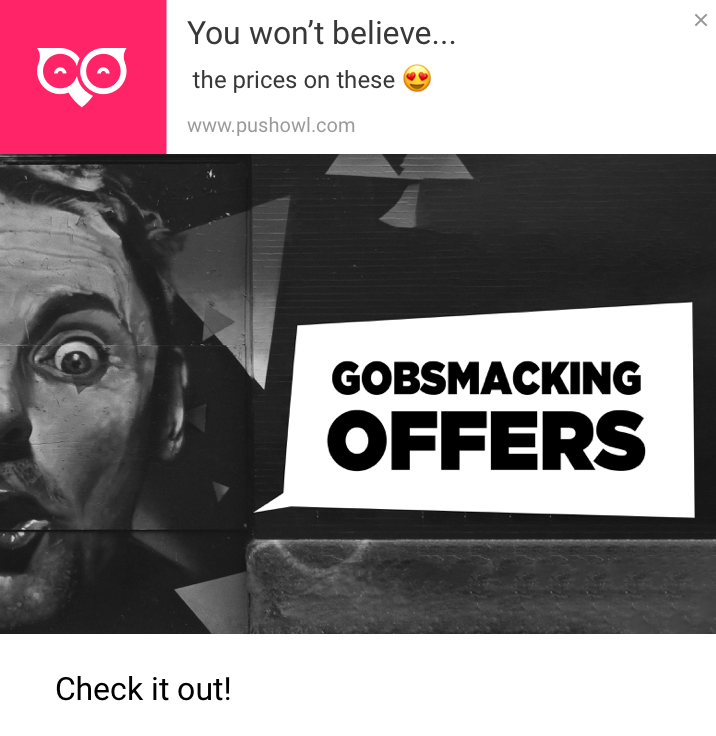 Target your old customers by sending push notifications tailored to them. You can use the segmentation feature to send a campaign with an exclusive promotion to your customers and compel a revisit (and even another purchase) from them. These are just 3 of the many types of promotions you can send. 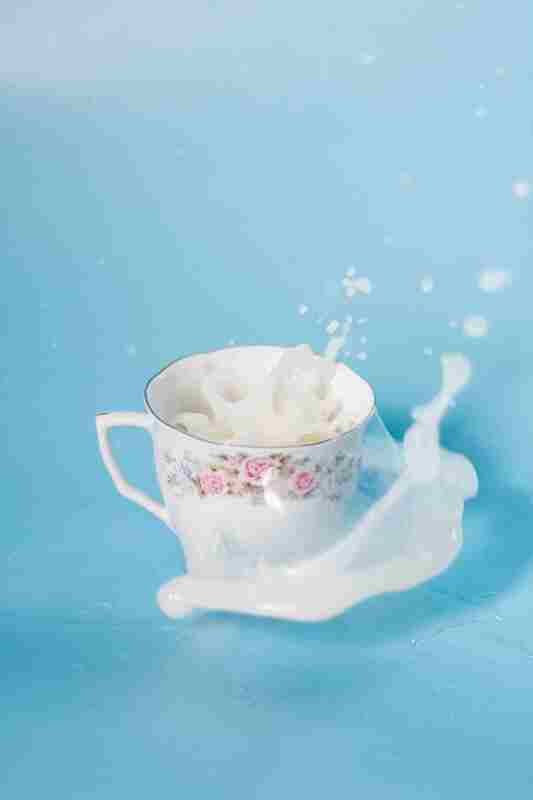 You can pick from a range of campaigns from our blog post on the 13 Types of Campaigns That Drive Higher Sales. What can you do to personalize your push marketing to your industry? We dug deep to find unique experiences that you can provide to your subscribers that sets you apart. 1. 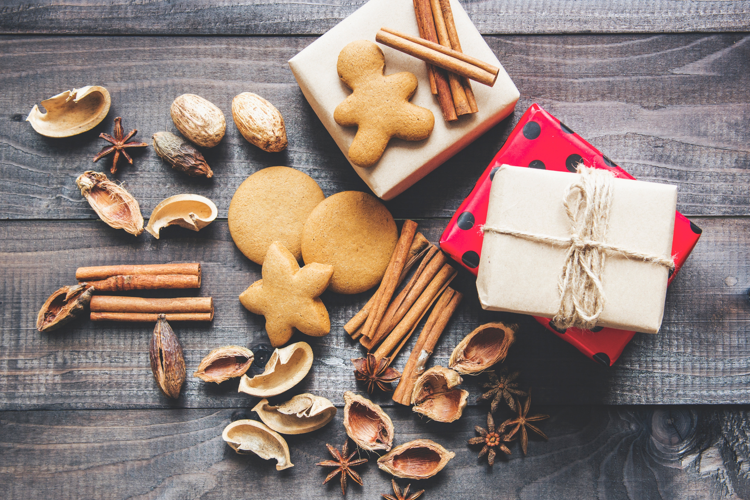 Use Segmentation to tailor your promotions to specific audiences. Every store has a vast pool of user personas with different needs, behaviors, and characteristics. One set of your audience might be new subscribers who haven’t purchased yet while some others may be customers you want to bring back. Your subscribers can be segmented and targeted based on their location or the device they use. With the Segmentation feature, you can tailor your push notifications to your audience segments and increase your conversion rates. You can read about Segmentation and how to get started with the feature. 2. Enable the Abandoned Cart Reminders automation to ensure you don’t lose a sale in the cart. With the average rate of cart abandonment being 69.89%, it's more important than ever to set up remarketing channels to retrieve these carts. But you don't have to spend too much time trying to bring back your visitors and ensure they complete their checkout. You can instead set up Abandoned Cart Reminders, an automated push notification sequence that instantly reminds and brings back visitors to your store to checkout their cart. If you want to set up a well-rounded remarketing using multiple channels from email and push notifications to search and Facebook ads, you can read this comprehensive guide to Recovering Your Increasing Abandoned Carts. 3. Set up integrations between PushOwl and other apps to allow you to send personalized requests and updates as push notifications. PushOwl integrates with several Shopify apps to allow store owners to power their store and customize its functionalities easily. 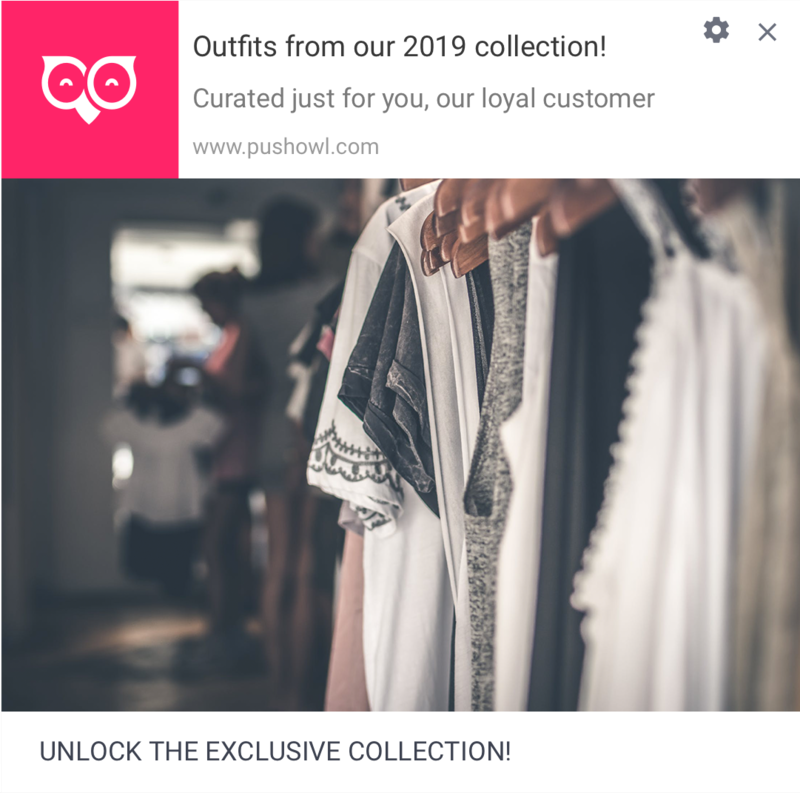 With these integrations, you can tailor your push notifications to be personalized to each customer and make them do a lot more than promoting your store- from receiving reviews from customers to sending wishlist updates. Set up review requests with Judge.me, Stamped.io, TrustSpot, and Loox Reviews. 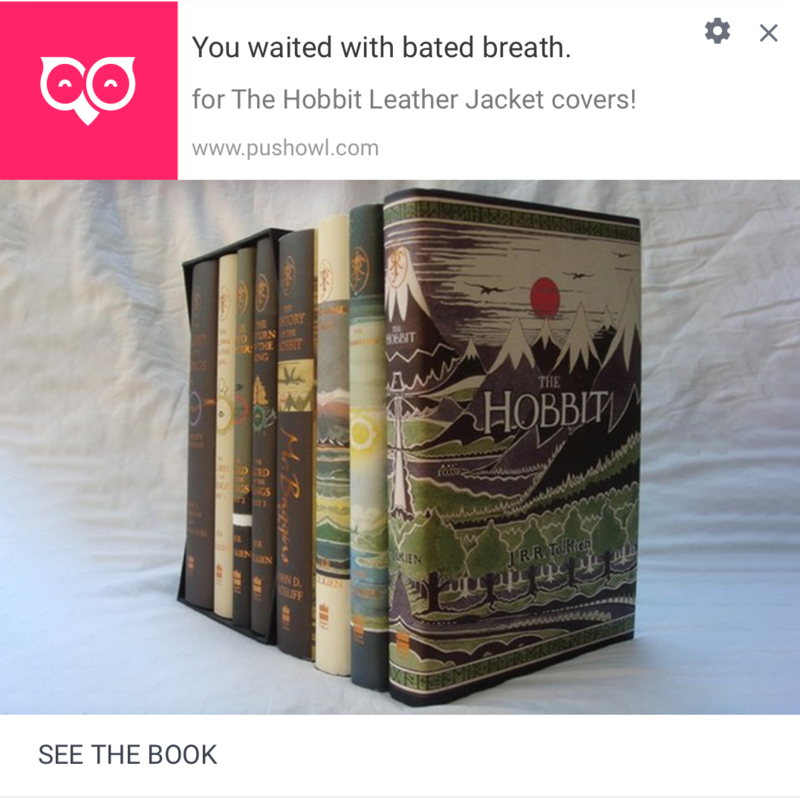 Send push notifications to your store's PWA with Litefy, PWA by Ampify Me, and Plobal Apps. Send push notifications about products that are back in stock with the Now Back in Stock app. Send push notifications about wishlist updates and request for reviews with SocialShopWave. Set up automated notifications to be sent while the visitor is on your store with Fera.ai. As a dropshipper, you need to reach your customers instantly, especially if you deal with in-demand products and flash sales. Push notifications can act as an additional revenue channel for your store by giving your promotions get higher visibility and helping you recover your abandoned carts without any hassle from your side. Get started with this powerful marketing tool. 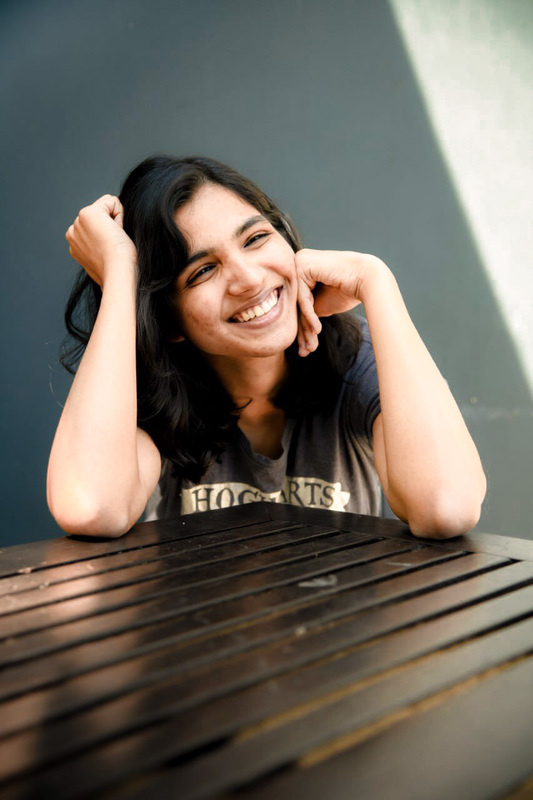 Asiya is the content writer at PushOwl. When she isn't talking about push notifications, she can usually be found writing about culture or juggling fictional ideas in her head.